DNA replication is among life’s most important processes, providing a way for an organism’s genetic material to be reproduced so it can be passed from cell to cell. For the first time, scientists have characterized that process for an entire plant genome. NC State University plant biologist William Thompson and his colleagues published their findings in the August issue of The Plant Cell, describing the process that corn uses to unravel and replicate small segments of its chromosomes at different times. While DNA replication has been well characterized in animal cells, little has been known about the replication timing programs in plant cells, said Thompson, Distinguished University Professor of Plant and Microbial Biology. The research has important implications for developing healthier, higher-yielding corn. Not only that, it also helps explain how a large mass of tightly compacted DNA in a cell’s tiny nucleus can orchestrate plant growth and reproduction. A single nucleus from a single cell of a corn plant typically contains two sets of chromosomes, each of which contains over 2 billion base pairs, or “letters,” of DNA and over 30,000 genes. “If DNA from a single set of chromosomes could be unraveled and placed end to end, it would be more than 2 feet long. To fit in the tiny nucleus of a cell — many times smaller than the tip of a human hair — all this DNA is compacted in various ways,” Thompson said. Because DNA can’t be replicated in its compact state, higher organisms have evolved sophisticated programs, called replication timing programs, to unravel and replicate small segments of their chromosomes at different times, he said. The researchers found that the replication program in corn differs in several important ways from those of animals and yeast. Thompson and Linda Hanley-Bowdoin served as principal investigators for the project. 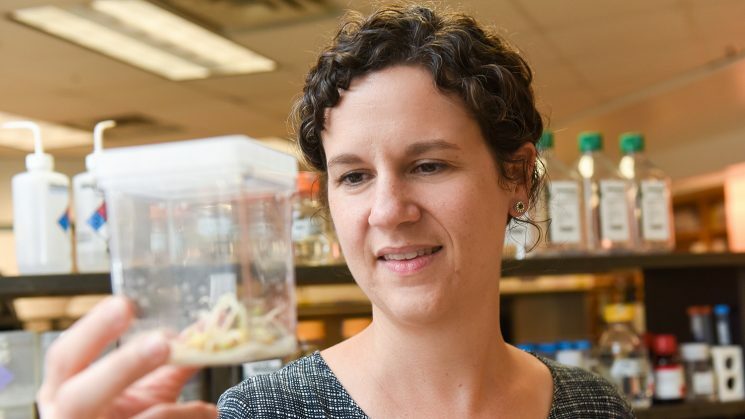 Emily Wear from NC State’s Department of Plant and Microbial Biology was lead author of the paper. Other participants were from NC State’s departments of Plant and Microbial Biology and Horticultural Science; the Texas Advanced Computing Center at the University of Texas, Austin; and Cold Spring Harbor Laboratory in New York. Their work was funded by the National Science Foundation’s plant genome research program.